A peaceful, friendly, healthy, and active community that fosters neighborhood pride, encourages coopertion and promotes harmony. Promote and protect the general welfare of the homeowners, Maintain a safe, secure, friendly, and enjoyable place to live. drug enforcement in rancho 2 (8/18/2016) - With the references above regarding Drug Enforcement in Rancho 2, May I request your presence on Saturday, August 20 10 AM at the Multipurpose Hall of Rancho 2 Chapel, Rodeo St., Rancho 2. Marist afternoon shift scholarship fund-raising (8/30/2016) - Conversation with Marist (afternoon shift) '99 Rosemarie Congayao Jimenez Core Group Member Marist School Afternoon Shift Alumni Association regarding the impact of her Marist Afternoon Shift High School education in her life. Marist school afternoon shift web.tv.filM (8/17/2016) - "Yes, I will help raise scholarship funds for the tuition of more Marist School Afternoon Shift High School Students!" More than just housing (8/21/2015) - MASS HOUSING IS ALSO ABOUT FINANCIAL FREEDOM Low-cost housing developer 8990 HOLDINGS (HOUSE) CEO JJ Atencio shared GMANETWORK article "Properties and Mutual Funds are the Best Investments" on his FB profile and commented: "More than just housing, mass housing is also about financial freedom." 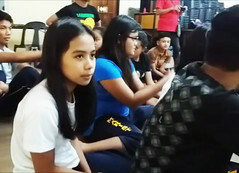 MSAS scholars learn theater arts (8/30/2016) - Meet the beneficiaries of the Marist School Marikina Afternoon Shift Scholarship Program . Msasaa core group & batch reps Meet up (8/22/2016) - MSASAA… invites friends to support their project to increase the number of scholarships granted to financially deficient but deserving students to the Marist School Afternoon Shift High School Program.